Edition is home to just 19 sophisticated, contemporary spaces created with flexibility in mind. Priced from $2,750,000 NZD (including minimum of two bathrooms, two carparks, one media room and a storage unit) this two bedroom apartment is guaranteed to deliver spaciousness, luxury and sophistication. Floor-to-ceiling windows emphasise the high stud and allow natural light to flood in, while every apartment has a space that connects to the outdoors; some have two or more. Each residences' living spaces are paved with silver-toned travertine tiles that extend on to the loggia or patio. In the living rooms, furniture can be custom-made by Bureaux to fill the space perfectly. 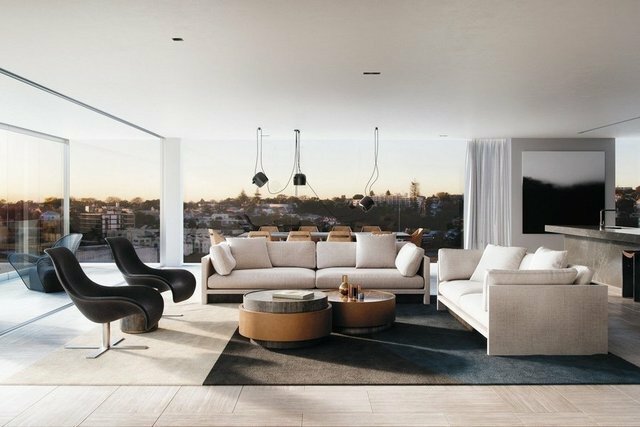 Each unique apartment has been designed thoughtfully to feature a luxurious material palette that exudes a sense of generosity, space and simplicity. Edition is perfectly positioned in the heart of Parnell to allow its residents to make the most of the city's best cafes, restaurants, galleries and boutiques. Exquisitely designed by architects Monk Mackenzie with interior design by Bureaux. The building's exterior is artful and unlike anything else in the city; the interiors are designed thoughtfully to feature a luxurious material palette and to bring their residents comfort and calm. The design of Edition is referenced in the apartment's kitchen islands, which are beautiful stretches of mitred stone with cantilevered ends. Warm-toned, grey fumed oak cabinetry conceals high-end appliances from view, and complements the pietra grey marble splash backs. Discerning cooks will appreciate the Miele ovens and induction cooktops, along with the Miele dishwashers. All apartments also feature Bosch fridge-freezers and Italian tap ware in the main kitchen spaces (and in the sculleries featured in some apartments).